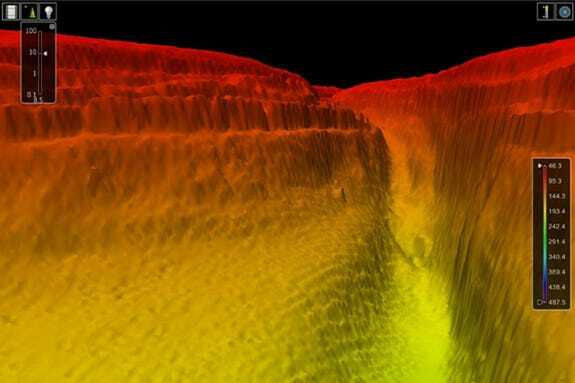 A canyon on the floor of the Red Sea rendered in 3D and discovered by the UK Royal Navy’s HMS Enterprise. A canyon more than 800-foot-deep has been discovered on the floor of the Red Sea by the U.K. Royal Navy’s HMS Enterprise, using an echo sounder that produce 3D images of the feature.The survey ship was probing the topography of the bottom of the Red Sea as part of a mission to better understand the waters of the Red Sea west of Suez, Egypt, and their safety for shipping and navigation, according to a release from the U.K. Ministry of Defence (MoD). The data from the sounder can be compiled into a 3D image of the ocean floor. The “Grand Canyon-style” feature, as the MoD release calls it, measured 820 feet (250 meters) in depth. The find was initially reported by Discovery News. The commanding office of the Enterprise, Derek Rae, said that the canyon could have been created by ancient rivers cutting through the layers of rock before the area was flooded and became the Red Sea. There is also the possibility that it is a younger feature, he said in the release, scoured by underwater currents and still in the process of being formed. Or they could have been formed by some combination of the two processes, he added. “It is, however, almost certain to say that this is the closest that humans will ever get to gaze upon these truly impressive sights hundreds of meters beneath the surface,” Rae said. The Enterprise is scheduled to stay in the Middle East until the summer, further mapping the seafloor. Its sister ship, the HMS Echo, was previously in the region for a 19-month deployment and found several shipwrecks and other obstacles. Reach Andrea Thompson at [email protected] and follow her on Twitter @AndreaTOAP and on Pinterest. Follow OurAmazingPlanet on Twitter @OAPlanet. We’re also on Facebook and Google+.